Good grades are not as hard as most students think they are. It has nothing to do with studying for hours at a time. In fact, studying for hours at a time is usually a sign that you’re doing something wrong. It’s a sign that you may not be studying quite as much as you think you are. And if you are, you may be defining studying wrong. Most students think that investing a ton of time into “studying” is all they need to do to get good grades. That’s totally wrong though! I’ve talked to hundreds of students that study hours every school night just to get subpar results. I’ve also talked to some of the most study averse students in the world and found grades (often while in top notch schools) that top their class. So… are you really investing that much time into studying? No… you do this while studying because it lets you enjoy it in between the time you’re studying. You can’t text your friends and study (unless it’s literally a study group testing or something.) You can’t watch a movie and study. You can intermittently stop studying to text your friends. You can intermittently stop watching the movie to study. That’s because studying requires focus. It’s the next piece of the study formula that too many students overlook. Now the formula is getting more complete. The important part about your study routine is not only your study time. It’s also your study focus. If you’re only 50% focused on studying then it cuts the value of your study time into, at most, 50%. For most students it’s even worse though. Focus is hard to switch between multiple tasks that require intense focus. Sure, you may be able to listen to music and study with minimal loss of efficiency but you can’t bounce from a deep conversation with a friend and back into studying within seconds. Your brain is going to get caught up in whatever it wants to do more. (Of course, most students prefer just about anything to studying. In that case, you shouldn’t ever make studying compete for focus versus anything it will lose against.) Instead of studying you’ll just get caught up thinking about whatever else you’re doing. Using this formula, most students can produce great results but there is another piece that, if not accounted for could stunt a student’s ability to produce great results. Studying isn’t as simple as taking information and putting it in your brain. The human brain isn’t designed to study in the way that most people wish they could study. Students regularly sit and stare at their study material hoping that staring at the information for a certain amount of time would implant the information somewhere in their brain. It just doesn’t work that way though. The human brain has evolved to only memorize information that it considers essential to survival. Things like physical landmarks stick into a person’s brain automatically. I just noticed that happen to me just the other day. I was driving someplace that I’d thought I’d never been before but out of nowhere I saw a little ice cream shop that triggered a memory from almost two decades ago when my parents took me to eat their a single time in my life. The brain remembers that easily. Remembering the year Lincoln got assassinated won’t give you calories directly implanted into your stomach. That means it’s significantly harder to remember than that ice cream shop. Since you can’t just read the information and expect it to stick, you need to look for better methodologies to convince your brain that the information you’re trying to learn is unbelievably important for your long term survival. A much more powerful way of convincing your brain the information you’re learning is important is by making your brain remember it (repeatedly). So… instead of reading your textbook and reading it again, you might read your textbook and then but then put it down and try to write the information you read. After a single instance of pushing to remember information, it’s given a dramatically higher priority to your brain and you have a significantly higher chance of remembering it when you need it. For more ideas on getting information to stick you might want to read 6 Memory Strategies You Need In Your Study Toolbox. Of course, there are tons of tweaks to these methodologies. Focus and time are dramatically less complicated factors to figure out. There are millions of methodologies that can be used. There are tons of studies that say how well different methodologies work. The options are countless. That being said, you don’t need a perfectly effective methodology if you invest the required time and focus into the equation. For the average student, it may be better to worry about this factor as a potential handicap instead of factor to improve. I may have spent years of my life trying to experiment my way into a perfect study methodology but that isn’t required to reap the benefits. t’s worth thinking about if you’re using a bad study methodology but if you’re retaining a reasonable percentage of the information you’re learning then you’ll be fine. In fact, if you want to get all the benefits of my years of experimentation then you can find it right on this blog. Is this the whole formula? Hell no. The formula is significantly more complicated than that but never mistake the formula for “Time=Results” and using resources like this one, you can enjoy life dramatically more. This isn’t the only aspect of school most students don’t understand. You might want to read 101 School Hacks For Better Grades & A Better Life. 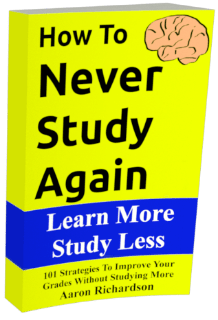 Do you want to know how to study in less than 15 minutes a night? That’s what this blog is all about. Be sure to follow and check out the archives for all the details. ← Q/A – Should I Improve My Grades? My coder is trying to persuade me to move to .net from PHP. I have always disliked the idea because of the expenses. But he’s tryiong none the less. I’ve been using Movable-type on a number of websites for about a year and am nervous about switching to another platform. I have heard fantastic things about blogengine.net. Is there a way I can transfer all my wordpress content into it? Any kind of help would be greatly appreciated! This is a brilliant article, I like how you mention that studying for hours and hours is not a good sign. I often see students sacrifice sleep, food, any leisure time etc just to study more and still never get the grade they aimed for. Hard work is well and good but there’s always a limit and our lives shouldn’t revolve around school and grades.